Cat insurance is the perfect way to stay prepared for unexpected veterinary expenses and can protect you against veterinary bills associated with common feline health issues. Although outdoor cats may have more exposure to harmful situations, indoor cats need pet insurance too. 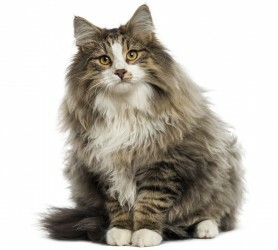 Many cat owners mistakenly believe that being a primarily indoor cat means they’re protected from accidents and illness, however, indoor cats can be more prone to ingesting things they shouldn’t (such as plants, rubber bands, dental floss, and poisonous materials), and to obesity from a more sedentary lifestyle. Routine wellness care is not typically covered by insurance plans but is often available as a policy add-on. For more information visit our Wellness Plans information page. Pet insurance prices vary with each provider and are typically based upon the cats breed, age, location and pre-existing conditions. Most providers will also allow you to customize the parts of the plan that affect your monthly payment, such as the annual deductible. This way, you can make the plan fit your budget and lifestyle. Insurance companies will often offer discounts for insuring more than one pet, paying annually rather than monthly and if your pet is spayed or neutered. Find out more by receiving a quote for your cat today.